Strategic Human Resource Management: A Balanced Approach (Paul Boselie) Complete summary of all chapters of Paul Boselie's book. Second edition. Written in English. Uitgewerkte leerdoelen strategisch HRM Elaborated learning objectives for the course strategic HRM. It is a brief summary of six pages in which all the important points are discussed for the key. SHRM: A Balanced Approach. Superfijne samenvatting Super convenient comprehensive summary so you can easily get your exam. When you learn this, you do not have to read the book! Samenvatting boek Boselie Strategic Human Resource Management Samenvatting Strategic Human Resource Management (MAN-BCU008), 2e jaars. Boek: Paul Boselie - "Strategic Human Resource Management: a balanced approach". 2e editie. Geschreven in studiejaar 2015-2016. Samenvatting: Strategic Human Resource Management A Balanced Approach (2nd Edition) - Strategic Human Resource Management Engelstalige samenvatting van het boek 'Strategic Human Resource Management A Balanced Approach' (2nd Edition) van Boselie. Alle hoofdstukken (1 t/m 14)! Zo volledig mogelijk, dus ook zo goed mogelijk voorbereid op je tentamen! Samenvatting Strategic HRM (Boselie) Summary of Chapters 1/6 m + 12 & 13. Samenvatting boek: Boselie - Strategic HRM The file is a summary of the book Paul Boselie - Strategic Human Resource Management, the book is part of the Human Resource Management Section. The book is treated on the basis of the sequence of the lecture material. At the end, the entire glossary of the book. Note, the chapters are not all in chronological order. Chapter 11, 12 and 13 are missing. Furthermore, all the chapters treated (H1 tm H10 and H14). Strategic Human Resource Management - A balanced approach - Paul Boselie A full summary of the book. Mainly in English with some Dutch words to simplify. Strategic management: Concepts Strategic management is one of the fields in management studies where basic concepts are involved.Strategy is some sort of future plan of action, usually understood as being undertaken by senior management at a high level of abstraction. Note this is not always the best definition of strategy, as you will see later in notes when you shall go through the levels of strategy. This compendium provides a comprehensive overview of the most important topics covered in a strategict course at the Bachelor, Masters or MBA level. The intention is to supplement renowned strategy notes for ease of understanding during exams.Throughout this compendium theory is supplemented with examples and illustrations. 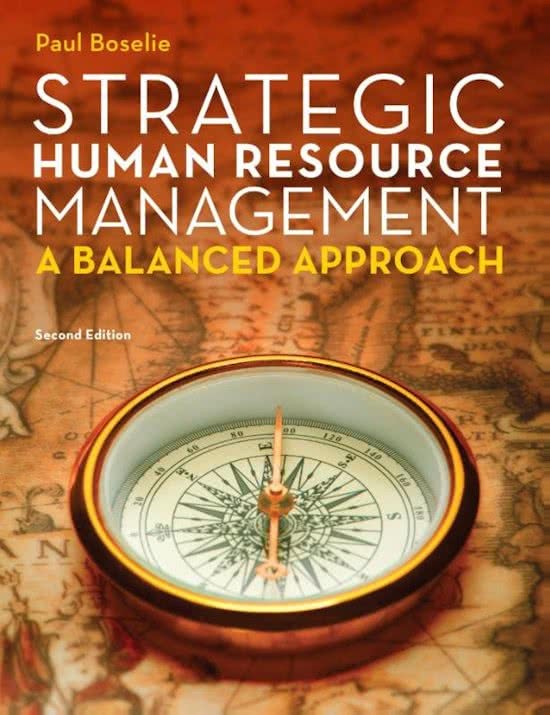 On this page you find summaries, notes, study guides and many more for the study book Strategic Human Resource Management, written by Boselie & Paul. The summaries are written by students themselves, which gives you the best possible insight into what is important to study about this book. Subjects like Strategic Human Resource Management, SHRM, HRM, Human Resource Management, Bedrijfskunde, Samenvatting, Groningen & Leerdoelen will be dealt with.